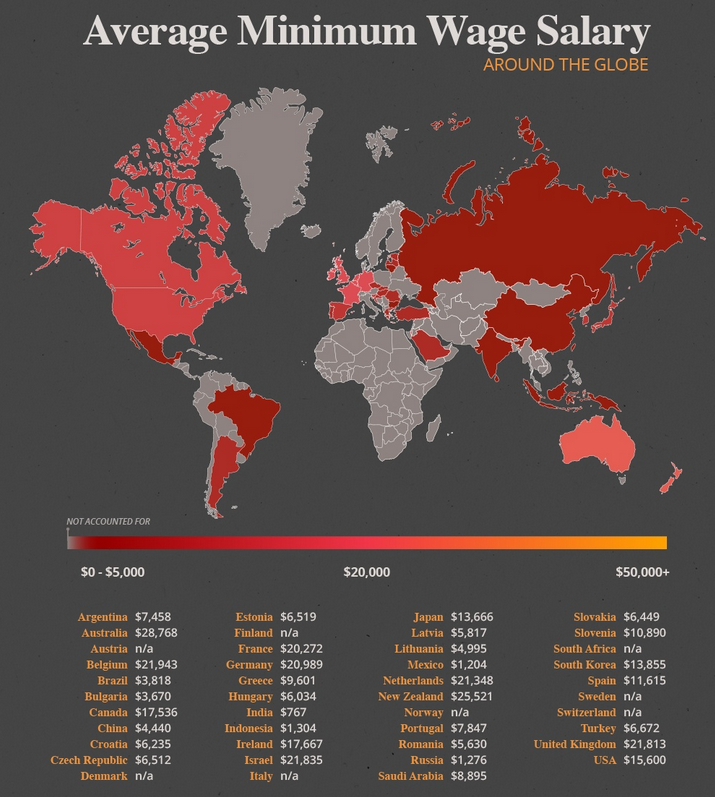 Data from relocation company, CapRelo, compares the average annual wage around the world, including public service related jobs like teachers and nurses, which are often perceived as undervalued when it comes to pay. All around the world there are jobs that need to be done, and people that are willing to do them, even if the work is hard and the compensation is sometimes lacking, said CapRelo. The group said it looked at the average job salaries around the world by country and how they fair across a number of common fields. For the specific jobs it researched, CapRelo said it relied on self-reported salary information supplied by workers from around the globe. It pointed out that several countries such as Norway and Sweden do not have federally mandated minimum wages, instead relying on other processes such as union negotiations within each industry to set standards. “In those cases we have listed a minimum wage as n/a,” CapRelo said. South Africa is also listed as n/a. The country’s National Minimum Wage Act 9 of 2018 (NMWA) came into effect on 1 January 2019. It ensures that every worker will is entitled to payment of a wage not less than R20 for each ordinary hour worked. On a minimum wage, South Africans can earn R42,000 ($3,000) annually, well below fellow Brics countries Brazil ($3,818), and China ($4,400), but ahead of Russia ($1,276). Australia shines brightest on the list, with an average minimum wage salary of $28,768, ahead of neighbour, New Zealand ($25,521), and the UK ($21,813). CapRelo’s data showed the average salary in the nursing field. “While it’s doctors that are known for making lots of money and are the ones glorified on medical television shows and in the popular conscience at large, anyone working in the medical field in the real world knows that nurses are a truly indispensable part of any good medical team, without whom countless doctors and patients would be much worse off,” it said. 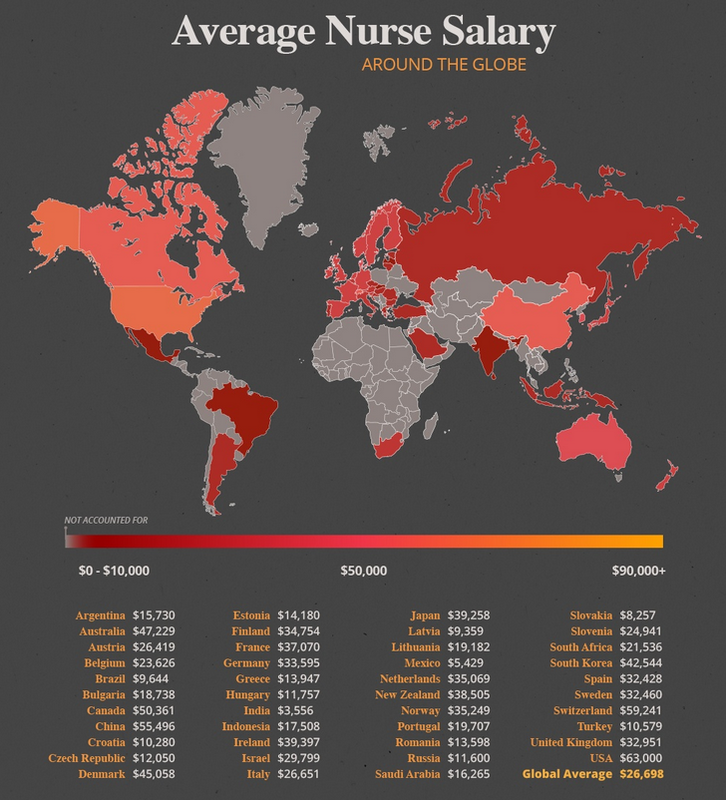 The analysis found that pay for nurses varies wildly across the globe from $3,556 annually in India to $63,000 in the United States, the best of any nation in the study. 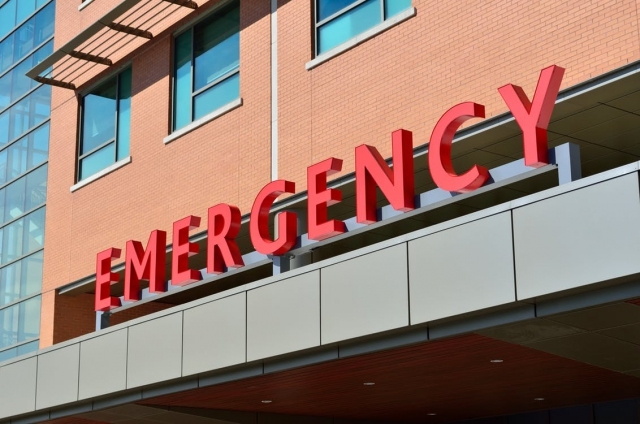 “The average nursing salary in the USA is over twice the global average for the profession, showing that the American medical industry recognises just how important nurses are,” it said. According to the Public Service Co-ordinating Bargaining Council of South Africa, Nurses can expect to earn between R160,600 and R459,200 annually. CapRelo’s data showed that nurses in SA average $21,536 (R302,000) annually, well below the global average of $26,698. Another profession with a reputation for being under-appreciated and underpaid is education. 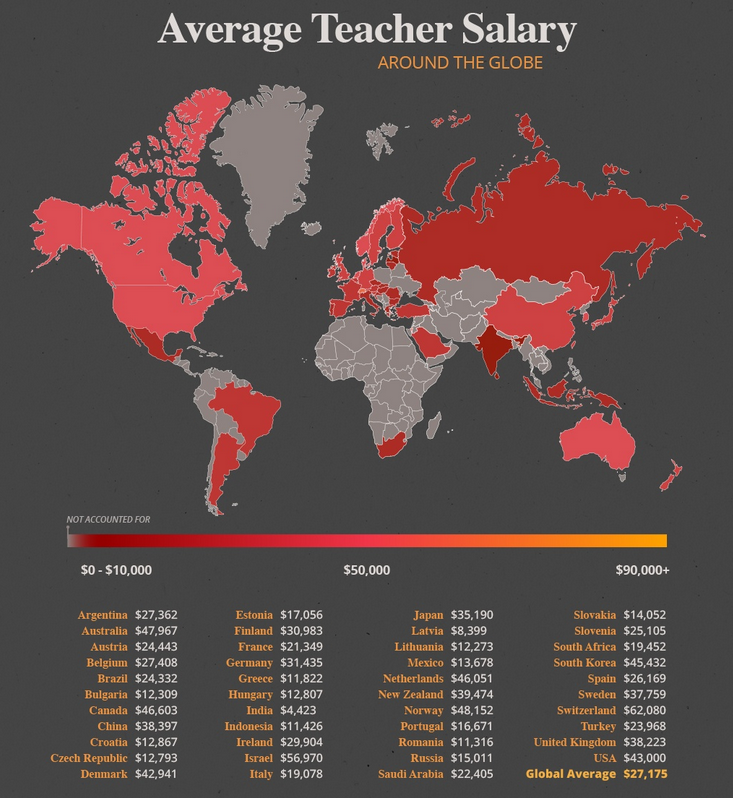 While American teachers were among the top-10 best paid in our analysis, they earn almost $20,000 a year less than the average teacher in Switzerland ($62,080), the country that compensates their educators the best. According to the Public Service Co-ordinating Bargaining Council, teacher salaries vary broadly in SA at between R115,500 – and R993,500. This is obviously dependent on experience, private vs publc, and position, with school heads able to earn particularly high wages. According to CapRelo’s data, local teachers earn an average of $19,452 (R273,209) annually – far less than the global average of $27,175. A report in the Sunday Times in late 2018 showed that skilled teachers are ditching South Africa to pursue careers in Abu Dhabi. A study conducted by University of KwaZulu-Natal master’s student Tatum Niemack, found that local teachers are leaving the country for financial, social, religious, and political reasons. A big incentive to want to make the move to the United Arab Emirates, is the high salary the Sunday Times said, noting that teachers in Abu Dhabi can earn between R50,000 and R78,000 per month, up to five-times more than a local salary. South African Council of Educators (Sace) spokesperson Thembinkosi Ndhlovu called the trend a worry for local skills development.